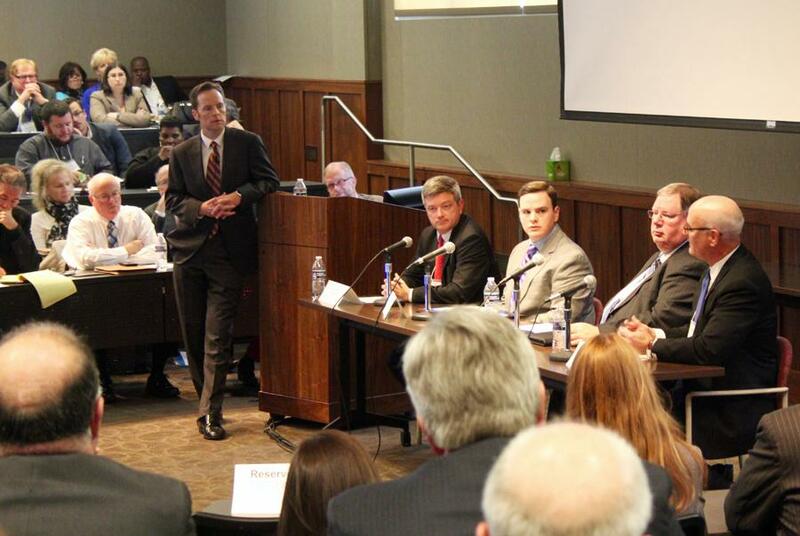 Four Kansas legislators participated in a panel Tuesday in Wichita sponsored by a coalition of 14 Medicaid expansion supporters. Seated from left are Senate Vice President Jeff King, Sen. Michael O'Donnell, Rep. Dan Hawkins and Rep. Jim Ward. “There is no more fervent anti-Obamacare person than Governor Pence,” Doug Leonard, president of the Indiana Hospital Association, said Tuesday at a Wichita forum. The plan that Pence crafted, which federal officials approved in January, uses Medicaid dollars to purchase high-deductible health insurance plans for adults making up to 100 percent of the federal poverty level, or $11,770 annually for individuals and $24,250 for a family of four. The state then contributes money to a Personal Wellness and Responsibility, or POWER, account that beneficiaries can use to cover out-of-pocket costs. Unlike traditional Medicaid recipients, Indiana beneficiaries must pay a portion of their premiums. Brownback and large conservative Republican majorities in the Kansas House and Senate have staunchly resisted expansion for the past three years. But struggling rural hospitals and the story of how Indiana found a way forward on the issue spurred a panel of legislators to talk Tuesday about what it might take for Kansas to pass its own alternative plan. Senate Vice President Jeff King, a Republican whose southeast Kansas district saw a key hospital close this year, said it’s time for a serious discussion about the specifics of a Kansas plan. "Saying ‘no’ to everything has to stop being a viable political option because there are real lives that are being affected,” King said. King was one of four legislators who participated on a panel at the forum sponsored by a coalition of 14 Medicaid expansion supporters that included hospitals and health foundations. A crowd gathered early in the lobby of the Kansas Leadership Center before filing into the auditorium and filling every chair. The audience included legislators, advocates for people with disabilities and health organization lobbyists. “This is a who’s who of Kansas health care,” said Ira Stamm, a Topeka psychologist and mental health advocate. After the Indiana officials made a presentation, King said he was impressed with that state’s expansion plan. He said a Kansas plan would have to include similar cost-sharing elements to have a chance of passing. In addition, King said the Kansas budget crisis means an expansion plan could pass only if it did not require money from the state general fund — something Indiana officials said they were also able to accomplish. Rep. Dan Hawkins, a Wichita Republican who chairs the House Health and Human Services Committee, said legislators should work within Brownback’s Medicaid expansion guidelines. Those include eliminating waiting lists for home and-community-based support services for Kansans with disabilities. “That waiting list needs to be taken care of before he moves on,” Hawkins said. During a question-and-answer session, Joe O’Rourke, president and CEO of New Beginnings Enterprise in Neodesha, asked if Brownback’s guidelines, which would substantially increase the cost of expansion, were meant to preempt discussion of the issue. Hawkins said he believed the governor was sincere in his belief that the state should use its “limited resources” to serve those with disabilities before “able-bodied” Kansans. But after the event O’Rourke did not seem convinced. John Monroe, a constituent services representative for Brownback, attended the event. Tim Wood, who formerly ran a campaign dedicated to eliminating the lists for the Disability Rights Center, said no disability groups had adopted that position. Wood said the Kansas Hospital Association was right in saying that the support services covered under the Medicaid waivers are different than the medical coverage provided by expansion. He also said that the 150,000 Kansans who would gain medical coverage through Medicaid expansion would not just be “able-bodied” individuals. Some would be Kansans with disabilities who weren’t previously eligible for Medicaid. Rep. Susan Concannon, a Republican from Beloit who attended the discussion as an audience member, said she believes the Kansas Hospital Association could put forth a plan that would satisfy all the conditions voiced Tuesday except for the waiting list elimination. However, Sen. Michael O’Donnell, a Republican from Wichita who sat on the panel, said many legislators from rural areas are worried about their hospitals closing. But he said they also are concerned about expending political capital voting for Medicaid expansion only to see hospitals close for other reasons. Rep. Jim Ward, the panel’s lone Democrat, said no plan could guarantee that there would be no future hospital closings. He also said his party would be open to adopting a red state model for expansion. “I believe anything that expands access to affordable health insurance would be supported by the Democratic caucus,” Ward said. King said he’s ready to start discussing the nitty-gritty policy pieces. But he said unlike last year, expansion advocates need to propose a detailed plan. “I don’t think this is something we can discuss entirely in the abstract,” he said. Tom Bell, president and CEO of the Kansas Hospital Association, said such a plan is forthcoming. Brownback privatized the Kansas Medicaid program in 2013. Now called KanCare, the nearly $3 billion program is administered by three managed care organizations. KanCare now covers about 425,000 low-income children and families, plus disabled and low-income elderly adults. Adults with dependent children are eligible for KanCare coverage only if they have incomes below 33 percent of the federal poverty level, or $7,870 annually for a family of four. Non-disabled adults without children aren’t eligible regardless of income. Expansion would extend KanCare coverage to non-disabled, childless adults with incomes up to 138 percent of poverty, annually $16,105 for an individual and $32,913 for a family of four. Kansas Senate Vice President Jeff King is taking issue with Governor Sam Brownback’s reasons for opposing Medicaid expansion. Melika Willoughby, Brownback’s deputy communications director, outlined those reasons in an Oct. 6 email to supporters. Referring to expansion as a “masquerading component of Obamacare, Willoughby said the governor believes it would “morally reprehensible” for the state provide health coverage to low-income Kansans “who choose not to work” before providing support services to all of the disabled Kansans now on waiting lists. When Rep. Jim Ward read the latest lawsuit brought by Kansas officials against the Affordable Care Act, the Wichita Democrat thought the federal action at the center of the suit sounded familiar. Republican state leaders who initiated the lawsuit say it’s an essential part of their ongoing fight against federal overreach by President Barack Obama’s administration. Both Kansas and Missouri are underperforming when it comes to reducing the number of uninsured within their borders. From 2013 to 2014, all 50 states recorded statistically significant reductions in their uninsured rates, mostly because of the implementation of key provisions of the Affordable Care Act, according to new data from the U.S. Census Bureau. But most states saw bigger reductions than those posted in Kansas and Missouri.